People who consume 18 grams of protein from whole eggs or from egg whites after engaging in resistance exercise differ dramatically in how their muscles build protein, a process called protein synthesis, during the post-workout period, researchers report in a new study. Specifically, the post-workout muscle-building response in those eating whole eggs is 40 percent greater than in those consuming an equivalent amount of protein from egg whites, the team found. The discovery, reported in the American Journal of Clinical Nutrition, suggests that the widespread practice of throwing away egg yolks to maximize one’s dietary protein intake from eggs is counterproductive, said Nicholas Burd, a University of Illinois professor of kinesiology and community health who led the research. The yolks also contain protein, along with key nutrients and other food components that are not present in egg whites, Burd said. And something in the yolks is boosting the body’s ability to utilize that protein in the muscles. “This study suggests that eating protein within its most natural food matrix tends to be more beneficial to our muscles as opposed to getting one’s protein from isolated protein sources,” he said. In the study, 10 young men engaged in a single bout of resistance exercise and then ate either whole eggs or egg whites containing 18 grams of protein. Researchers administered infusions of stable-isotope-labeled leucine and phenylalanine (two important amino acids) to participants. This allowed the scientists to maintain and precisely measure amino acid levels in participants’ blood and muscles. 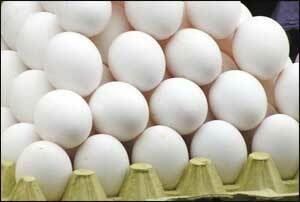 The U. of I. Poultry Research Farm developed eggs for the study that also were isotopically labeled with leucine. This allowed for precise tracking of where the food-derived amino acids ended up after participants ingested them. The team took repeated blood and muscle biopsy samples to assess how the egg-derived amino acids were appearing in the blood and in protein synthesis in muscles before and after the resistance exercise and eating. But when the researchers directly measured protein synthesis in the muscle, they found a very different response. “We saw that the ingestion of whole eggs immediately after resistance exercise resulted in greater muscle-protein synthesis than the ingestion of egg whites,” Burd said. Previous studies suggest this difference has nothing to do with the difference in energy content of whole eggs and egg whites – whole eggs containing 18 grams of protein also contain about 17 grams of fat, whereas egg whites have no fat. Studies from Burd’s lab and others show that simply adding fat to an isolated protein source in the diet after exercise does not boost protein synthesis.